Today I’d like to introduce you to someone special, Tam Warner Minton. 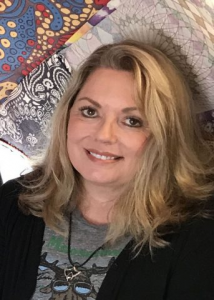 I met Tam in a blogging support group. I was immediately a fan of her one of a kind, stunning underwater photography. Her passion for our oceans and all sea life is infectious. Be sure to check out her brand new book and her blog, you won’t be disappointed. In the back of my mind, I always thought I would publish a book someday. I never thought, though, that I would write a non-fiction book, but it is where my passion led me! I fell in love with the ocean before I can even remember. My family began going to the ocean when I was a very little girl and I have always been fascinated by life above, and below, the water. As a kid I watched Jacques Cousteau documentaries, and I was completely mesmerized by his exploration of the ocean. SCUBA! He actually went below the waves and showed me a world I had no idea existed, but knew I wanted to see. I was on vacation in Cozumel, Mexico when someone said, “do you want to learn to scuba dive?” The answer was yes, and so my passion was born. We live in a time when human activity has brought us to the brink of ecological disaster. As a diver of over thirty years, I have seen the changes in our oceans, and the death of our reefs. Global warming is hitting the ocean hardest, because the ocean absorbs 93% of the heat in our atmosphere. Our oceans are under extreme pressure. Anyone who has read my blog knows I go on citizen science dive trips often, trying to help scientists with their research into the ocean and our ocean giants. At dinner one night, a man said to me, “Sharks are endangered? I didn’t know that.” How can anyone not know that? Only a three toed sloth hanging in the jungles of Panama wouldn’t know that. Is that really how little our society knows about our planet? We simply have to reach out and educate people about the ocean, and get them excited about it! And who better to become enthusiastic than children? We need a generation who cares about the planet, and understands what is happening to it. I thought why not introduce kids (and their parents and grandparents!) to the colors and creatures of our oceans! What better way to get people interested in the conservation of our ocean resources, perhaps to even inspire future scientists, than introducing them to the underwater world? I wanted a project to do exactly that. My vision is a book series of photos and fun facts about different ocean animals including fish, crustaceans, eels, mollusks, stingrays, sharks….the possibilities are endless! The first book of that series was published this month. I invite you to look at a preview of ALL FISH FACES on Amazon! 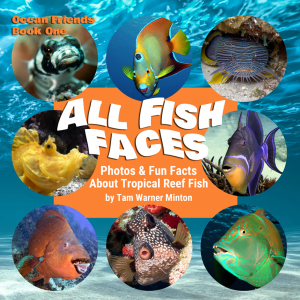 ALL FISH FACES is a fun and colorful book featuring my own underwater photography. 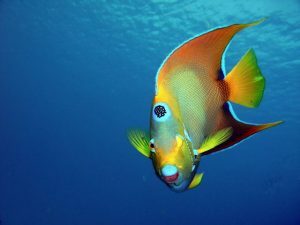 Popular tropical fish are present in all of our oceans, but they look different in the Atlantic than they do in the Pacific. A beautiful Queen Angel in the Caribbean…but Angel fish look quite different in other oceans! I am hopeful that this book will appeal to kids and their elders so we can look forward to the next generation’s care and understanding of our oceans. The book also contains advice on how to help preserve our oceans and ocean animals. A portion of the book proceeds will go to Marine Megafauna Foundation to assist in their scientific research into our ocean and our ocean giants! Tam is the author of the empty nest travel blog, Travels with Tam, and is always renewing, revamping, and reinventing life! She has traveled to all seven continents, and is an advocate for citizen science, the environment, and getting out of one’s comfort zone. An avid scuba diver, Tam takes many trips involving diving and the marine world, and is an amateur underwater photographer. Tam challenges her perspective, confidence, knowledge and physical ability by traveling the world, and sharing what she has learned with others. Her book series, Ocean Friends, introduces us to beautiful underwater creatures we may have never seen before! As a former university Lecturer and college consultant, Tam is a believer that knowledge is power, and education is always a positive force. Twitter @travelwithtam, http://instagram.com/travelswithtam/, https://plus.google.com/+TamWarnerMinton, Linked In Tam Warner Minton. 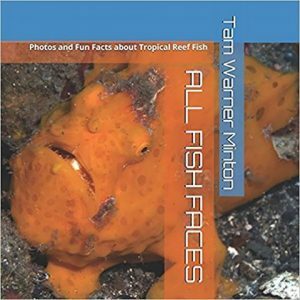 ALL FISH FACES Photos and Fun Facts about Tropical Reef Fish, is now available on Amazon, and at several other bookstores! Thank you for a wonderful article! Thank you Carol Cassara and Toni McCloe! I’m very excited about my first book! I’ve been a fan of Tam’s (and Randy’s) for many years. She really is inspirational in her thirst for adventure and following her passions! It sounds as those Tam has a beautiful passion, one that keeps her busy and engrossed. Just reading her post made me feel as though I were sitting on the beach looking out at the ocean. Thanks for posting that Doreen.